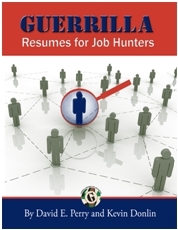 Guerrilla Job Hunting - Never job hunt alone! Job hunting need not be a lonely isolating ordeal. It can actually be a little fun [yup I'm serious here]. IMHO everyone should have a job-search buddy. The main objective of your "buddy" is to keep you motivated and honest with yourself. Few people can work well in isolation, [cave men like me are an exception] but that's exactly what happens when you're looking for a job. You're typically sitting at home night and day doing research, making calls, and writing letters. Life can become very lonely very quickly. sometimes it's tough to stay motivated. I think it's important to have someone else to bounce ideas off who will make a "big deal" over your daily accomplishments, because you're not likely to do it for yourself. - Your buddy can be looking for a job too but that's not a necessity. - The number one rule: be honest with each other. - When someone is slacking off, the buddy needs to ask why and try and help work through the blockage. - Your buddy needs to hold you accountable, for both the quality and quantity of leads you are following. - Your buddy's main jobs are to point out opportunities you may have missed, and to keep you motivated.